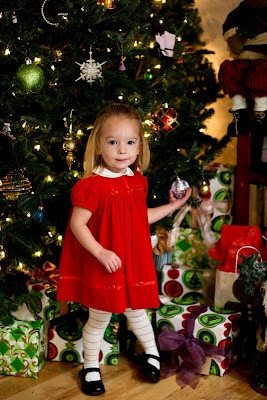 I really love Christmas time, I am pretty sure I have told you that before, but it is even more fun with a 2 1/2 year old. BellaRose is sort of slightly aware of what is going and if we show enough excitement for Christmas and Santa coming then she gets excited. I sort of made her believe that she wanted a bike for Christmas, and what do you know Santa brought her a bike! It looked so perfect and cute sitting under the tree waiting for her. She gets so excited every time she sees it and says "Christmas came back". What a sweet little person she is. The bowling ball and pins are from my old boss/friend and his family, but we thought it would be fun to add it under the tree. 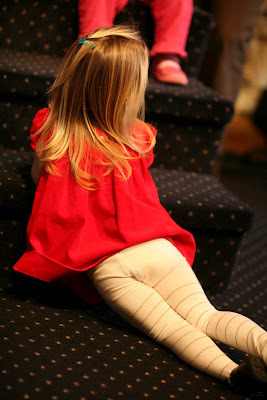 So here is a sweet Christmas story, Worth and I were in her room reading "twas the night before Christmas" the night before Christmas, and we are all on her bed and she is between us, and she goes and puts both of her arms around us! She about made me cry, my little Sweetie Baby! BellaRose's bike by her tree. Yes she ate three suckers before 6:30 in the morning. When the snow started on Friday, BellaRose requested that Worth make her Frosty. Worth was hunting at the time so hearing her request upon his return he began plotting the perfect snowman. He had to call for backup. Apparently it takes a village to build Frosty. BellaRose wanted to be warm for some of the building so she went and got her blanket, her doll, and her thumb and watched from inside. The fun does not stop with Frosty, Becky called us over from across the street to go sledding. 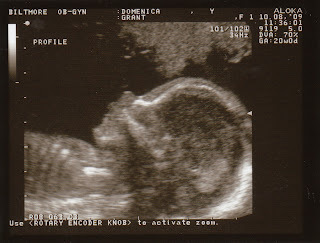 Being 30 weeks pregnant with Hollings I decided to just be the photographer, my most comfortable role. Everyone else went down on the sled. Even BellaRose by herself. I was not the biggest supporter of that, but she laughed the whole way down and the whole way up as Uncle Ben carried, saying "again". I guess sometimes Moms can be fun haters. Worth had one final mission on his snow day and that was to build an igloo. I am pretty sure that this igloo will still be on our porch come summertime. This bad boy is not going to be melting anytime soon, especially b/c our deck gets no winter sun. Him and Trent spent a cool 2 hours constructing and shaping this thing. Again, BellaRose watched from inside while we made Cowboy cookies. So this concludes the loads of snow day pictures and posts. Until next time when we get another snow like this in about 10 years. Oh goodness!! We have been waiting a long time for a snow like this. We got a foot of snow yesterday and it was wonderful. We still have power, Praise the Lord! Some of my friends weren't so lucky on that front. We have baked goods and warm soup. Our tree is lit and the heat is on. We are SO fortunate. BellaRose liked the snow until she fell and her hands got cold because she did not keep her mittens. She requested that Worth build her Frosty the Snowman so her Uncles Ben and Noah came and helped build her Frosty. I will show you those pictures next, until then enjoy this Winter Wonderland of pictures! This name is all family. Worth's mother's maiden name is Hollingsworth. That is where Worth comes from, so we are sort of naming her for Worth, and of course T-love. Well you should know where Domenica comes from, but if you don't my real name is Domenica, it means Sunday in Italian. I just adore that name and would hate for it to go away, so it is not. I don't have a middle name, well at least I did not before I got married, now my middle name is my maiden name. I love that idea of the maiden name becoming the middle name after marriage. I guess Hollings will just have to decide what she wants to do at that time. So if you love the name you can tell me, if you don't then please don't tell me or say anything about it. Of course then I will get nervous about your silence, but no matter what this is her name! 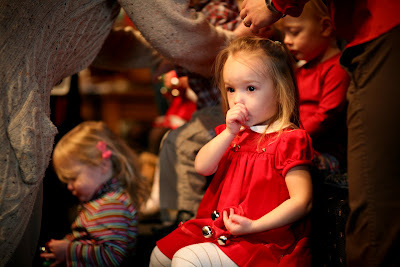 I took this one picture of BellaRose at her Christmas program and it just reminded me SO much of Hollings' ultrasound picture, don't you think?! 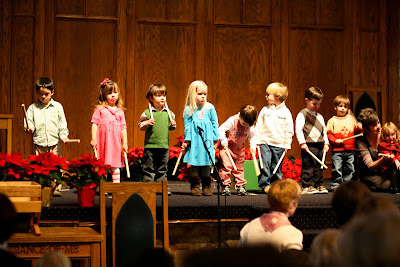 The Greatest Christmas Pageant Ever! 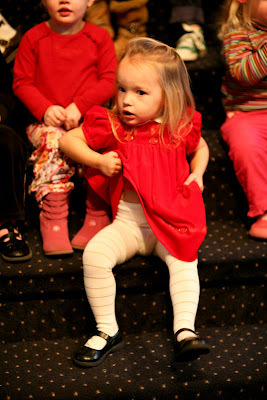 As I mentioned last week BellaRose had her 1st Christmas Program on Friday. I was wondering what in the world she would wear and I looked through her closet and discovered this dress. Angela had passed it on to me from Taylor. I just LOVE it, I think that it is gorgeous only made more gorgeous by putting a BellaRose in it. Worth and I were wondering if she would actually go on stage and sing her songs, she can get pretty shy, but she did wonderful! We were VERY proud parents all day on Friday, with sleeping in the big girl bed to this! I know that there are a lot of pictures here, but I just could not decide on which ones to share. Playing "Jingle Bells". She took the "Heys!" very seriously. Will and Ryland were next on stage and BellaRose had to take some pictures of her boys! They ended the Christmas program singing "We Wish You A Merry Christmas". This was BellaRose's interpretive version. I LOVE it. It just screams 2.5 year old! In the years to come when we talk about BellaRose, and we are asked to describe her as a child, we will talk about her determination. We will ALWAYS reference this December 11, 2009 when she said she would sleep in her big girl bed and she actually did it! She said Friday and my goodness she meant it. We laid her down for her nap in there and it took a little bit but she finally fell asleep and stayed asleep. We actually had to wake her up. It was a bit of a rude awakening too as I was taking pictures of her with the flash in her pitch black room. She even slept in there last night! Needless to say we are SO proud of her! 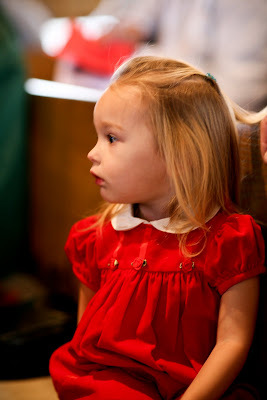 She had such a big day yesterday too, she was in her first Christmas Program at her school. It was so sweet. I actually got a little teared up as I watched her "sing" jingle bells. 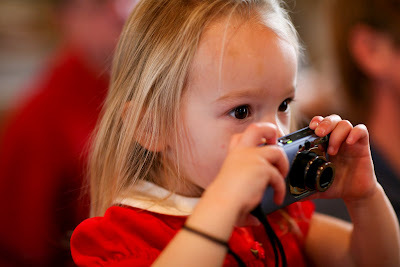 There was just too much to blog about so I am going to go one post at a time. For the time being we will embrace this determined little girl! Ok so I know a lot of you have already seen this, but this is BellaRose's Big Girl bedding! I am totally in love. This won't be her bedside table, but I just had to share a sneak peak. BellaRose is now saying that she will sleep in there on Friday. The date has moved up so that is good!